Physical therapy graduate students Lydia Lytle and Jennifer Dannenbring help Samantha Schroth, Ms. Wheelchair America 2015, use a new motor-driven arm cycle as part of a multi-disciplinary research study that bridges engineering and rehabilitation. Regular exercise is important for maintaining health, especially for wheelchair users. However, exercise equipment to be used with a wheelchair is not always readily accessible, adjustable or effective. A team of mechanical engineering, kinesiology and physical therapy students are collaborating on developing new exercise equipment for wheelchair users. Steven Elmer leads the team, which is working to bridge the gap between engineering and rehabilitation. Elmer is an assistant professor in the Department of Kinesiology and Integrative Physiology, and also has affiliated appointments in the Departments of Mechanical Engineering – Engineering Mechanics and Biological Sciences. 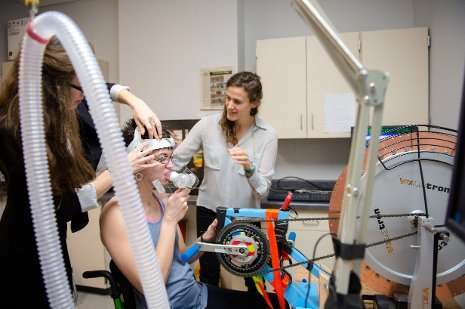 Over the past several months and into the New Year, Elmer's team is bringing ten wheelchair users to campus to use the specially designed exercise equipment and measure how it impacts upper body muscles. "All of our wheelchair participants are enthusiastic about being healthy and independent," Elmer says, explaining that the exercise equipment uses a specialized motor-driven arm cycle to "provide a high-intensity workout for upper body muscles, but without overtaxing the heart and lungs." Wheelchair users can do this type of exercise regardless of their fitness level to help strengthen their upper body muscles. Having increased strength and fitness can help individuals be more independent and ultimately have better quality of life. Especially while recovering from an injury and adjusting to life in a wheelchair, upper body exercise is important, but it can be difficult if the individual's cardiovascular system can't keep up. Long term, it's crucial for wheelchair users to have strong upper body muscles in order to do everyday activities like pushing their wheelchair and transferring in or out of bed. To get at those muscles, the exercise equipment works elbow, shoulder and trunk muscles using eccentric movement. That's a lengthening movement, like slowly setting down something heavy. And while lowering a heavy couch or doing a reverse bicep curl with a 50-pound weight is dangerous, doing controlled eccentric motions can help wheelchair users build up strength faster. The team's first step was to refine the equipment to make it more accessible and adjustable for wheelchair users. That's where mechanical engineering student Tyler Root and the rest of the Velovations Enterprise team were tasked with the challenge of designing equipment that is both adjustable and robust. After that, kinesiology students like Matthew Kilgas are developing the exercise regime to be used with the new equipment. Finally, physical therapy students Jennifer Dannenbring and Lydia Lytle are implementing the new exercise equipment with wheelchair users and obtaining feedback on the design and effectiveness. 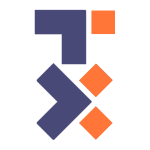 The research surrounding this project is supported by a Research Excellence Fund Seed Grant, Michigan Tech ICorps Site Workshop Series Award and donations through Superior Ideas crowdfunding. Wheelchair users from the local community as well as those from as far as Southern Wisconsin and Southern Minnesota visited Michigan Tech to participate in the project. These participants ranged from older adult wheelchair users looking to improve their general health to competitive wheelchair athletes striving to improve performance. For example, one master wheelchair athlete has completed more than 75 handcycle marathons; another finished in the top three at the Detroit Marathon, while a third is a member of a three-time collegiate national champion wheelchair basketball team. Most recently, Samantha Schroth, Ms. Wheelchair America 2015, came to Elmer's laboratory to use the new equipment. Being a research participant is no easy stroll through the park. The physiological testing takes three days and pushes these individuals to the max. 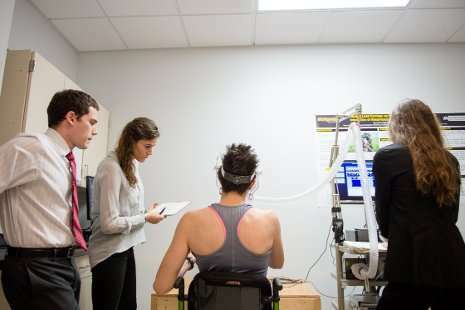 At one point during testing, physical therapy students Dannenbring and Lytle helped Schroth set up for a VO2 max exercise protocol, a test to assess cardiovascular fitness. Schroth slipped a mouthpiece into place, connected to a long tube hooked up to a machine to measure her oxygen consumption and carbon dioxide production. Everything is kept in place by headgear and a face mask. Lytle then handed her a giant blue nose plug. This is no swimming pool plaything; though cushioned, the medical-grade device does its job well, completely cutting off nasal airflow. Fully plugged in and breathing through her mouth, Schroth adjusted her wheelchair closer to the hand pedals and began pushing forward. Running the full test, she'd push harder and harder until she could pedal no more. She mentions afterwards that she maxed out after seven minutes; some of the male participants can make it to 13 or 14 minutes. "I barely made five," Dannenbring confides as she helps Schroth remove the face mask and tubes. Schroth laughs and the two chat about different exercises and what it takes to train for handcycle races.